Ella's Kitchen - Geting Creative with Veg! Today, Holly, Lara and I made a creative crafty masterpiece using almost primarily vegetables! We were challenged by Ella's Kitchen to use some of the vegetables that they use to make their new range of 'my little BIG meals' to create a work of art and this tree was very much a join effort between the girls. It was messy but fun. Holly felt really grown up (it was the first time she has ever sat up at our table in a booster seat as opposed to a high chair) and Lara demonstrated great concentration adding little details such as a tiny hand-drawn birds nest with miniature blue eggs! My little BIG meals by Ella's Kitchen is a new range of single-serving meals designed for toddlers from 12 months upwards. Each of the dishes in the new range is made with between 5 and 7 different vegetables so we used a few of them to make our tree. First up, Holly pasted glue onto the trunk of the tree and both girls stuck on peelings from a sweet potato (one of the ingredients in the Creamy Coconutty Chicken Curry) to use as bark. Next, in the absence from any fresh herbs currently worth picking from our garden, we stuck on fresh spinach leaves to finish off the tree. The girls drew on grass, and nests and sky using markers and crayons before Holly and Lara finished off their masterpiece with some natural vegetable-based paints. Lara is really into her tech at present and I regularly have to wrestle my own tablet from her. She has been trying out a tablet designed specifically with children in mind - the Binatone Appstar which is now available in Argos. The Appstar comes in its own brightly coloured protective rubberised case which is great for protecting the corners of the tablet from bumps. It also has a small stylus attached by a cord for use on it's 7 inch screen. Lara struggled at bit at first with using the head of the stylus rather than trying to use it at an angle like a pencil but soon got the hang of it. The Appstar runs Android 4.0 which means that the interface is recognisable. However, the OS has been made child-friendly and by this I mean that the backgrounds are bright and bold and the icons are larger and less cluttered. In 'grown-up' mode the operating system is a little more like that which I am used to on my own tablet. I would say that I didn't find the user interface particularly intuitive to use, but Lara seems comfortable using the kid mode. The Binatone Appstar comes with a 1GHz processor and 4GB RAM and I think the price reflects this, it is certainly less powerful and responsive than the latest 'grown-up' tablets on the market but to be very honest, I don't think my four year old is looking for speedy response times or fast internet usage! The Appstar comes with a child-friendly internet browser and you can set up wifi connectivity when you first configure your tablet (through a step-by-step wizard) or through the parent settings. I haven't quite worked out what 'child-friendly browser' really ... as far as I can tell it is a very limited access to pre-configured web-pages. From the parent-mode the internet browser allows you to browse at leisure as you normally would do. The Appstar tablet comes with over 250 'apps' pre-loaded onto it; these range from small fun games such as hangman to educational videos about volcanoes. From autumnal craft inspiration to colouring apps. If you set up a credit card in your parent account then you can also choose to download new apps for your children from the Amazon app store. None of the built-in apps are bog-names that are instantly recognisable but I think they are as good as, and in many cases better than, any of the apps you would find to buy on a VTech or Leapfrog equivalent. The Appstar also features a built-in camera that allows you to take photos but this doesn't seem to have grabbed Lara's attention yet. The Appstar tablet is available exclusively at Argos for £99.99 and it is recommended for children from 4 years upwards. It comes with a mains adapter for recharging the battery - we found the battery life to be REALLY good, it survived nearly a week of occasional use without needing to be recharged. We were lucky enough to be asked to give a family's perspective on the Google Nexus 7 Android tablet by Currys. For us, a tablet needs to perform several different functions. The Nexus 7 from Asus is part of the Currys tablet range and it seems to have managed to offer us all of these features in one compact piece of portable tech. I was quite comfortable using the Android operating system (currently we are running Android 4.3 aka Jelly Bean) having tried it previously on my smart phone but I was doubtful as to whether I would find is usable enough for my every day tasks such as updating my blog, sending mails, checking weather and timetables etc. Thankfully, I actually found the Android interface on the Nexus 7 to be more usable than on my phone - it works beautifully on the larger screen (the Nexus 7 has a 7 inch LED screen) and the scrolling and icons feel very natural. The backlit LED screen gives really bright colour and amazing colour reproduction - photos appear crisp and full of light. Both of our girls took instantly to the Nexus 7. They are both familiar with a touch screen interface so it felt natural to them. The screen is smaller than they are used to and I think for our youngest daughter it requires dexterity she doesn't quite have yet but our 4 year old finds it a good size to sit and hold herself... she quickly discovered the CBeebies app on it! Ordinarily when I use the Nexus 7 I sometimes find it frustrating that the menu and navigation buttons aren't real buttons (they are icons along the base of the screen that change their location based on the rotation of the screen and they fade away when an app is in full-screen). However, when the girls are using the tablet, I'm often grateful that they can't find the buttons easily! Mr. B. has embraced the internet a little more since the Google Nexus 7 came into his life. He has discovered how easy it is to integrate your Google account with your mail app and your browser and use Google to log in to a number of different services. I've noticed him use social media that little bit more as well! The Nexus 7 is fast, noticeably more so than my phone or laptop... I guess that is largely to do with the compact nature of the apps we use on it; they only do what they really need to do. The tablet has a Snapdragon 1.5GHz processor and 2GB RAM. Our Nexus 7also has 16GB of storage space which I think could quickly run out if we are all using it for apps and music. At present I don't think we plan to use it to store images so space won't be used up that quickly. We found our Nexus 7 REALLY easy to connect to our home Wifi, the whole setup process took a matter of minutes. But for Mr. B, I think the feature of the Nexus 7 he has found most impressive is the voice recognition mechanism which integrates the microphone with several of the apps we use regularly... this week I witnessed him attempt to order a takeaway through an app using his voice... I didn't point out to him that this may have been easier using a traditional telephone! The only negative feedback that we have on the Nexus 7 is that because the screen is so compact, when you are using the keyboard, it tends to take over most of the screen space and it can be hard to reference back to the page you are typing on or for. I find it quite hard to keep up with Lara's thirst for craft activities which is why, as a working mum, a regular subscription to a service such as the Little Letter Company works really well. Lara recently tried out the weekly Little Letters subscription and I was so impressed that I have now asked family members to consider a regular subscription for Lara as one of her Christmas presents. Lara and I have tried regular 'activity' subscriptions in the past and I think they are perfect for families who either don't have access to craft materials or to the inspiration required to provide regular crafty ideas for kids but in the past I have questioned the value for money in terms of craft materials. I'm not sure Lara fits into either of the categories above but I still felt that the Little Letter company was right for us. For each week of your subscription, your child receives their own brightly coloured envelope in the post with a single fun crafty activity for the week. Lara REALLY loved the fact that her letters were addressed to her and by the third week of her subscription she was actively looking forward to the post arriving. Lara's Little Letters arrived on a Monday and her first two activities were complete within 48 hours of receiving her letter. Lara's first challenge was the weave her own placemat from foam strips and then decorate them using acorns and oak leaves sticky foam pieces. This required quite a lot of coaching from me but Lara enjoyed the challenge and was very proud when her masterpiece was complete. Her placemat pieces were accompanied by instructions and a letter with inspiration for further learning and exploring activities such as searching for things around the house which are 'under' or 'over'. Week two was perfectly timed to arrive as a life-saving activity for Mr. B! I was abroad when Lara fell and hurt her head at school. Mr. B picked her up from school and was worrying about how to entertain her for the rest of the day but when they arrived home together they found Lara's letter waiting for her. Inside they found the wherewithal to create this forest scene which now has pride of place in our hallway. Lara's final activity was to create an autumnal tree using foam pieces. For Lara this is still work in progress but having spent weekend enjoying all the fallen leaves, Lara is feeling inspired to finish off her creation. Little Letters cost between £2 and £2.50 per week, depending on how long you subscribe for. I would say that they could be bi-weekly and still offer as much fun and anticipation. I would also hope that in a longer subscription that there would be some different materials to experiment with - foam pieces are fun, easy and durable but craft activities for kids can cover so much more. Little Letters are currently offering some Christmas craft subscriptions which include the kit to make a Christmas card in December followed by a series of regular little letters in the new year - this would make an awesome Christmas gift for the little person in your life. 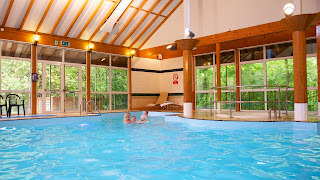 Last weekend we took a much-needed break away as a family to the Marwell Hotel in Hampshire. It was a great weekend away that we all enjoyed. The Marwell Hotel is nestled in its own little patch of woodland. 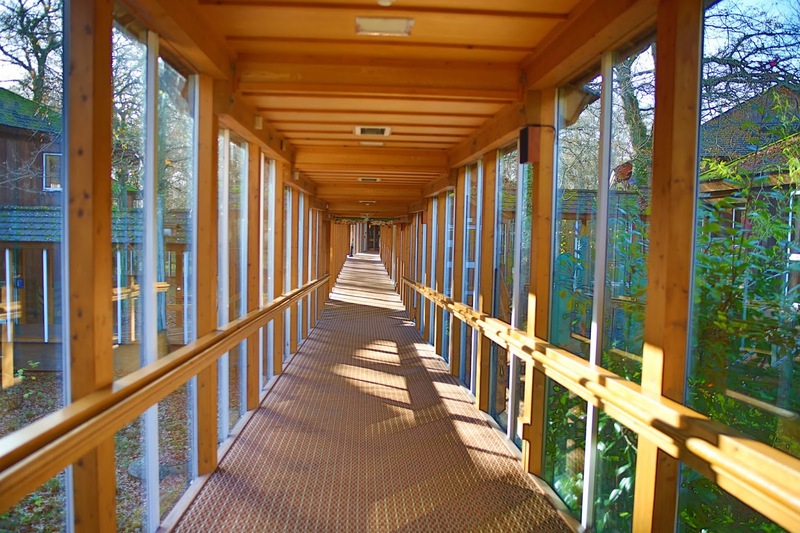 The hotel comprises a series of wooden 'lodges' which are joined together with covered glass walkways. The walkways make you feel like you are out among the trees even though you are tucked up in the luxury and warmth of the hotel - with the leaves falling around us, it was really very magical. 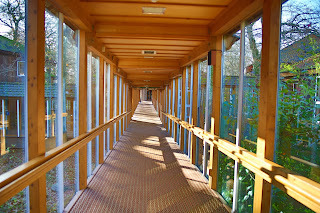 Describing the hotel as a series of lodges makes it sound incredibly rustic and when we first saw the lodges I was a little worried that they looked and felt a little bit like the kind of place you would visit on a school trip but in fact the Marwell hotel is very far from rustic. Inside our room we felt very pampered indeed - the room was really smart, beautifully decorated, pretty spacious and packed full of special little touches that made us all smile. The girls rushed straight to their bunkbed to investigate their free colouring sets while we headed straight for the REAL coffee maker and the complimentary cake! Our room had a DVD player and all the rooms have one available on request along with a series of family DVDs that can be borrowed from reception. There are also indoor games on offer as well as an outdoor play area for the children. We dined in the Marwell Hotel restaurant which was a very smart affair. The children were welcome during the early hours of the evening restaurant service and they were very well catered for. The menu for children offered a small selection of smaller family favourite dishes cooked to the same high standards as the full adult menu... Lara was flummoxed when she was served her first ever amuse-bouche, a small mug of beetroot soup. I got the impression that the staff didn't regularly cater for toddlers and pre-schoolers but that they did really well to try and respond to our needs throughout the evening. We all enjoyed our dinner - it was great to be able to share such a grown-up meal with our girls and I was really glad that they enjoyed the atmosphere of the restaurant as much as we did. Dinner for the four of us, including dessert, wine and drinks came to around £100. I thought it was good value for a special meal but I think that it makes the package deals at the Marwell Hotel very appealing for families because some of the packages include dinner. The Marwell Hotel also offer Zoofari package deals from £150 for a family room which includes family tickets to Marwell Wildlife which is a VERY short walk from the hotel. We visited Marwell Wildlife after a scrumptious breakfast and had a wonderful day spotting snow leopards, rhinos, giraffes (Holly's favourite) and poison dart frogs (Lara's new discovery!). On Sunday morning we took advantage of the hotel's leisure facilities. We took the girls to the small swimming pool and had a ball - the girls don't often get to swim together and the pool was the perfect size for a little person like Lara to practice her swimming. A morning dip is a great way to work up an appetite for a huuuuuuge cooked breakfast. I thought the buffet breakfast was brilliant and catered for all sorts of different tastes and once again I was impressed by the little details such as mini pastries wrapped in a warm cloth which were served with our toast. The Marwell Hotel is a short drive from Winchester in Hampshire and is easily accessible from the M3. Who wouldn't love a crunchy chocolate spider? Cadburys have lots of exciting chocolate treats on offer this year for Halloween parties and trick or treaters. Lara and her friends recently got together for a small party and the Chocolate spiders went down well (shame... I was hoping there would be some left for me). All of the boys seemed really excited by the special "Screme Eggs" which have a light green gooey centre instead of the traditional yellow and white filling. It's great to see some fun and innovative chocolate treats for this time of year rather than just great big bags of stuff. I love the Cadbury spiders because they make great gifts and because they are big chunks of chocolate that make a great one-person treat. This weekend Mr. B shredded two year's worth of financial documents in our Fellowes document shredder - a good habit to get in to if you want to help try and protect your identity. Two years worth of finances is quite some volume of shreddings and seeing as we don't have a pet who can make good use of the shredded paper, I decided to let the girls loose on the shredded paper and take part in the Fellowes smART Attack challenge. The Fellowes UK Google + page has a series of short videos with ideas of crafts to do with children using shredded paper such as papier mache, bracelets, wands, monsters and flowers. I think their videos are brilliant - step by step but nice and concise. The girls had great fun helping Daddy to shred all of his papers - with our Fellowes shredder I'm happy for them to get involved because it has a sensor which automatically cuts off the shredder if it detects little fingers coming close and Holly put it to the test a number of times! Unfortunately (or fortunately, I guess) all of Mr. B's papers were white so I was presented with the challenge of arty activities which involved just white paper. Holly made a shredded snowman and a shredded snowflake. White shredded paper works really well against a bold background colour. I painted the shape of the snowman and snowflake onto the card and Holly grabed handfuls of shredded paper and patted them down onto the paper. She used the paintbrush herself to put glue onto the pom poms for the buttons and eyes on the snowman, and for the points of the snowflake. We added a pipe-cleaner nose and I cut a hat from coloured card. Holly's eyes lit up when she realised that she had made a face! Lara made a sheep which required quite a lot of artistic wizardry from me to make it sheep-like! I think she would have been better off with a flock of smaller sheep. Both girls had great fun getting crafty with shredded paper and I shall definitely be doing this again. I can imagine Christmas wrapping paper making some great coloured shreds to play with. Check out the Fellowes G+ page for more great crafty ideas - you NEED to know how to make a shredded paper moustache! Lara and I often enjoy watching a movie together on a Sunday afternoon. 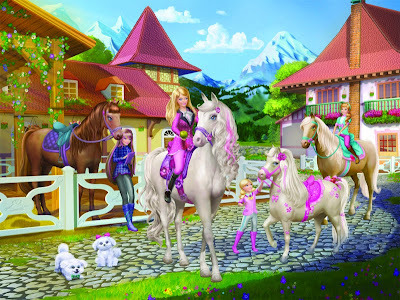 Lara is into all sorts of things at present, but Barbie is a relatively recent discovery for her so she was over the moon when we were asked to review the new Barbie movie - Barbie and her Sisters in A Pony Tale. Ponies don't feature highly on my list of top things to look for in a movie but Lara seems to be interested right now (I'm not going to question this in a 4 year old girl!) and very honestly, I had previously quite enjoyed the Barbie movies we had watched together. Barbie and Her Sisters in a Pony Tale didn't disappoint - even for grown-ups, it is a very watchable movie! Lara sat quietly and watched the whole movie with me; I think this may be a record. The story obviously made an impression on her because she rushed straight into school the following morning to tell her teacher all about Majesty the mysterious wild horse who comes to Barbie's rescue when she needs a horse for the all-important horse show. Barbie's sisters cover all sorts of ages and tastes. I was particularly taken with Skipper who seems more interested in her tech and her blog than with the ponies. I thought it was interesting that the movie just began to touch on her relationship with... boys (although this was totally lost on Lara). Lara most likes Barbie's youngest sister who thinks it is unfair that she only gets to ride a tiny pony... but then she is quite tiny herself. There were several points in the movie that Lara laughed out loud at her antics. Because the movie is based in Europe (in the bright sunny setting of the alps) there are lots of European accents. I didn't find any of the movie to make me cringe, which to me is very important if I am going to watch a film with my daughters. Barbie and her Sisters in a Pony Tale is a celebration of all things girly - ponies, pinks and Barbie all rolled into one. It comes out on DVD and Blu Ray next Monday the 28th October. I have felt a bit sorry for Holly when it comes to shoes - Lara wore her shoes for such short periods of time that they all became hand-me-downs for Holly to wear so we were very excited to be approached by JD Sports to review a pair of their infant trainers; It makes a change for Holly to have a pair of shoes all of her own! The other thing I have really noticed as a second-time mummy is that I am a lot more mellow about measuring Holly's feet. With Lara, I used to rush to the shops strictly every 4 weeks to get her feet measured but with Holly it tends to be more of a gut feeling when she is ready for a new pair of shoes. This is probably bad of me because I know how delicate little bones are but it is partly a reflection of how much more in tune with tiny feet I am now than I was before. I chose Holly these Nike Rift Infants Trainers because they looked like they would fit like a glove - and they do. These Nike trainers are quite unlike anything else I've seen. They have a firm toe area and sides but the foot is actually held in place across the top and back by a stretchy fabric which can stretch to exactly fit your child's foot. The end of these Nike infant trainers has a harder toe area to protect against scraping. I am a big fan of easy-fasten shoes for children (buckles and laces seem so impractical at this age) and these Rift trainers have a Velcro-style fastening across the top and across the back to allow you to get them tightened up just right. At first I think I was making them a bit too tight for Holly's feet as I could see marks on her feet after she had taken them off. Now though, I'm finding them perfect because I can get them just right. Holly is going through the stage of removing her shoes at EVERY opportunity. I remember Lara going through this stage so I know it is short-lived but my goodness, it's frustrating! When Holly isn't sitting down in her buggy or car seat she forgets about shoe removal and runs... she runs and runs. Hours before writing this blog post I witnessed Holly run the full length of a superstore about 8 times while wearing her new Nike trainers and I struggled to keep up. I've a funny feeling Holly may run for Britain when she is older. The Nike Rift is available in this white and fuschia pink design or in white and grey - I think the design of shoe would suit a girl or a boy. They are available in infant sizes 4.5 to 9.5 and cost £25. This is cheaper than many of the trainers I nought on the high street for Lara when she is younger so I think JD sports offer very good value for the quality of their infant trainers. We have just got back from a weekend away in a hotel - the first of many hotel stays in the coming weeks. This weekend we put our new Magicbed travel cot to its first real test and I'm so glad we have it for the weeks ahead. At nearly 18 months old, Holly can be pretty active in her cot which can often be a bit hair-raising in a rickety traditional travel cot which is why, a couple of months ago, we tried a hotel visit without a cot... we regretted our decision immediately and spent most of the night trying to convince her to lie down and go to sleep in a bed. I think it will be some time before Holly is ready for a bed, which is why I am quite so pleased to have come across the Magicbed. The Magicbed is a pop-up travel cot which takes a matter of seconds (and I mean less than 5 seconds) to put up and to collapse. It comes in its own zip-up travel case which has handles and a shoulder strap to make it easier to carry it along with your luggage. I have owned a popup travel cot in the past but this is something quite different. The Magicbed is the same size as a traditional travel cot (100cm x 60cm) but it rests on the floor. It is a one-piece cot so doesn't require any assembling other than placing the foldable mattress inside it. 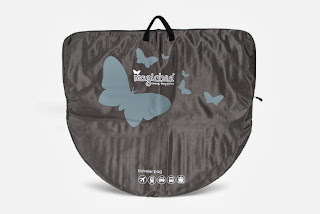 When Lara was tiny, we owned a compact pop-up travel cot which I will admit was lighter and more compact than the Magicbed but which simply wasn't practical - we couldn't use it at all with Holly because she was always too mobile to sleep on the floor. The Magicbed works so much better because it is a traditional cot shape, size and height so your baby can't roll over in it or climb out. Holly tried her best to shake it and tip the Magicbed over this weekend but she simply couldn't budge it! We placed our Magicbed in our car boot underneath all of our other luggage because it can lie flat. The bed folds flat by squishing each side of the cot down to the ground. You slot the mattress and the non-slip mattress cover into the bag and off you go. I was really pleased with the Magicbed mattress - most travel cot mattresses are lumpy, thin or uncomfortable where the folds are but this is nice and padded and the folds doesn't seem to be noticeable, due mainly to the fact that your baby doesn't sleep directly on it - the mattress fits into a pocket underneath the cot. The Magicbed is particularly cosy when you top it off with the super-soft cotton fleece sheet which sticks in place at the corners. I think the Magicbed is a great balance between convenience and practicality. Because it rests on the floor I think it is actually more stable than traditional chunky travel cots but I might worry about using it on a cold hard floor even with a nice thick mattress. I think that ease of use is the factor which appeals to me most so, despite finding it a little bit bulky when carrying it (large but certainly not heavy!) I think the Magicbed is an awesome travel cot. The Magicbed comes in a range of different colours, weighs just 3.4kg and I even available in a mini version for babies from 0-6 months (although I'd be happy to use the larger Magicbed for this age too). Since Lara started school in September she has really shown an interest in the more educational apps on our iPad. Our latest free app is Learn to Write with Mr. Pencil which is an app designed to help you child practice their pen control when writing and drawing but with an element of fun and challenge thrown in. Learn to Write with Mr. Pencil is a Leapfrog app and you can unlock the full version if you buy the Leapfrog Learn to Write With Mr. Pencil stylus which costs around £14.99. To unlock the app you have to stamp the stylus down and it took me several attempts to get it right. 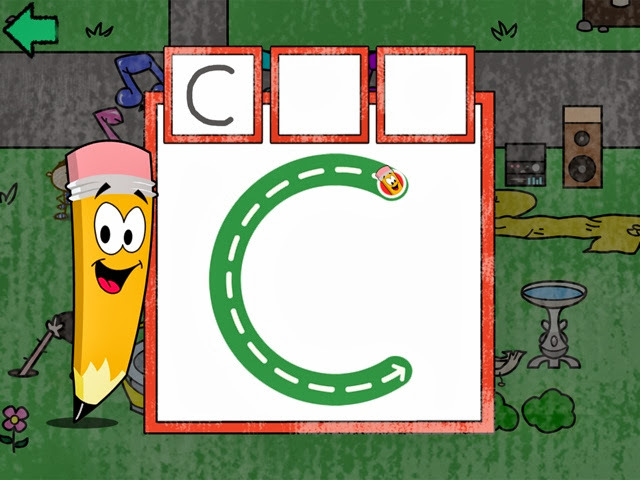 Learn to Write with Mr. Pencil is designed for children aged 3-6. Lara is 4 and a half and I think the tracing activities may be a little too easy for her on the pad because the screen size means that the letters and numbers are a lot larger than she would normally write with a pen. I think it would have been ideal this time last year when she was just learning to write letters. Lara seems to enjoy the game and challenge element of the app. The app is based in the town of Doodleburg where they are preparing for an arts show. As you progress through the letters, numbers and shapes you unlock other parts of the town where you find further activities to complete. Lara sat for nearly an hour playing this in one sitting and only gave up when she got to a tricky shape (I think it was a hexagon which required her to keep her hand very still. I think the app is a really nice simple letter drawing app - one of the best we have tried. The stylus is in the shape of a pencil. At first I was really disappointed to find out that Mr. Pencil was simply a stylus and nothing else (the box seemed a bit big for just a pencil!) but having researched other ipad stylusususueues (what is the plural of stylus?) I've come to the conclusion that Mr. Pencil is very similarly priced to others whether they are designed for adults or children. Mr. Pencil is very big and chunky which is probably best for younger children to help them learn to grasp a pen - for Lara I think it is probably too big as it feels alien to her compared to the pens and pencils she uses at other times. The tip of the stylus is very soft so won't damage your screen. Master Moves Mickey was such a massive hit with the girls last year and with everyone who has come to visit since so we were really excited to hear about the new Cheerin' Minnie toy from Fisher Price. Cheerin' Minnie is a pom-pom waving, ditty-singing character who has brought a little bit of happiness to our lives and the girls both love her to bits! Cheerin' Minnie is suitable for children of around 2 years upwards. Holly is a little younger than this at 17 months old but she loves Minnie mouse so much. When Holly gets home each evening she rushes into the living room to go and press the button on Minnie's bright pink high heels to make her start dancing. Minnie is a little over a foot tall, she has a pink spotty dress and pink and white cheerleader pom poms. When you press the button she says or sings one of about 12 different songs or phrases and waves her pom poms in the air. Our favourite routine is when Minnie Mouse sings "Hey Mickey you're so fine, you're so fine you blow my mind" - Lara thinks this is very fun. Minnie's body and face are quite hard and static, I think it is a shame her expression doesn't change. Her movement is also quite limited, just her arms move and her legs wiggle to make her move a little from side to side. I would say that, compared to Master Moves Mickey she is quite tame but because she is Minnie with her pink bows and spots, the girls love her. Goodnight Mo by StoryToys is a 3D interactive bedtime story app which is available on iPad, iPhone and iPod touch (and coming soon to Android). It is designed for children ages 15 months to 3 years old. My initial reaction to Goodnight Mo when I first opened it up to look at with 16 month old Hollywas delight. Mo is a very cute cuddly character and all of the colours of the app were bright, yet relaxing. The graphics are great and I really like the 3D effects on each page because the pages look as if they are a pop up book and the shapes on the screen move when you move your device. Very clever. I would say that the 3d effect and pop-up characters work best on the large screen of the iPad and in terms of Holly gaining the accuracy to be able to touch and interact with the items and characters on the page, the bigger screen is an advantage. However, I actually prefer using Goodnight Mo on the smaller screen of my iPod touch and the reason for that is that at bedtime I want Holly to be winding down for the night and the big bright screen of the iPad is too exciting for her to settle. The smaller screen gives us a better chance of actually being able to settle down. The idea of the Goodnight Mo story is that each of the 8 rhyming pages of the book is supposed to represent a different part of the daily bedtime routine. We are just about to move Holly into a cot bed and so it is really important right now that we start to drill into her the routine for bedtime so that she will recognise the signs that it is time to settle down - Goodnight Mo seems like a fun way to do this with her. The pages feature the process of getting changed, having a bath, brushing teeth and cuddling up in bed. Each page has a number of areas of the screen you can touch to animate the page such as flushing the toilet or changing the colour of the nightlight. There are lots of little noises that are made but the overall feeling of the app is one of relaxation. As you move through the book the colours get darker and more muted an the story has a slow, relaxing tune playing throughout (you can switch this off). I really enjoyed changing the language of the app - it is available in French, German and Spanish too. This really fascinated my older daughter, Lara, as she doesn't often get to hear other languages being spoken. I was impressed that the texts have been written such that they also rhyme in the other languages too. You can choose to read the text on the pages yourself as a parent or you can let the narrator do the reading; I find the low male reading voice very calming and so, it seems, does Holly. I can well imagine Goodnight Mo becoming a regular part of our bedtime routine. This weekend Lara and I made some extra special chocolate cupcakes for the Dr. Oetker Great Chocolate Bake competition. If you have looked at the baking aisle in your local supermarket recently then you may have noticed that all the Dr. Oetker baking products are sporting a pink flash advertising the Great Chocolate Bake. Using the codes on the packs you can get hold of free bakeware but the most exciting thing is their Great Chocolate Bake competition which offers a grand prize of a £3000 holiday in New York. The competition is a photo competition which takes place on the Dr. Oetker facebook page ; it closes on the 17th of October so HURRY!!! Although voting on the facebook pages is taken into consideration, the actual judging takes place by the promoter and an independent judge. Dr. Oetker sent Lara some chocolate baking ingredients to help us come up with some inspiration for a stunning chocolate cupcake creation. We melted 150g of fine cooks extra dark chocolate and blended it with a rich 5-egg sponge mix (150g self raising flour, 150g butter, 150g caster sugar and a teaspoon or one sachet of baking powder). To make them extra decadant, we stirred in 50g of dark chocolate chunks into the mixture before putting them into the muffin cases. Our cupcakes baked for about 25 minutes in a 180 degree oven and then came the fun. I made a thick buttercream icing with cocoa powder and swirled it on. Lara decorated the cakes with Dr. Oetker large chocolate stars, white and dark Dr. Oetker chocolate chunks, edible glitter stars and squeezy chocolate pudding sauce. I call them our midnight cupcakes. If you are looking for some inspiration for your own Great Chocolate Bake cupcake, I've created a pinterest board of chocolatey ideas. As the weather turned colder, Lara and I had to fight to save our tomato crop from blight. In a funny way, it reminded me of the movie Epic - we could have done with some Leafmen on our side. Epic is made by the creators of Ice Age and the style of animation is familiar (but I think it is quite a lot more impressive, certainly when it comes to human(ish) characters. Epic tells the tale of M.K (Amanda Seyfried) who is a human who takes on the legacy of the queen of the Leafmen (Beyoncé) to help with their fight to save their forest from blight. Collin Farrell gives the voice of the Leafmen's commander (he's a little over-enthusiastic in his missions) and Josh Hutcherson plays one of his descenting ex-soldiers. To be honest, Lara has no idea who plays each of the voice characters and in fact it is the characterisation of the animated people that had her enthralled. There is something very magical about the idea that there exists a whole world of tiny beings that we are all to busy or blind to notice and Lara seemed to have been inspired by the magic and the green forests - I think it reminded her of Tinkerbell and the fairies. Lara liked the characters of Mub and Grub (a slug and a snail) who added a little bit of humour to an animation that I would otherwise describe as an action movie with a magical twist. 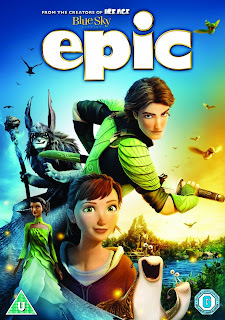 Epic is recommended for children from 7+ but even a few years younger Lara really seemed to enjoy it (and I can well imagine her re-enacting some of the scenes with her friends at school next week). 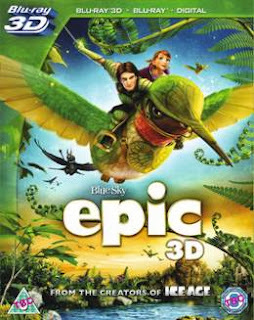 I thought Epic was great movie for Lara right now as it really drew parallels with some of the things she has been learning at school this term about the 'fairy forest' at the back of the school grounds; the benefits of rotten leaves and plants and the roles that different bugs play in the circle of life. There are points in the movie which could flow a bit better to keep up the action pace but I think for a slightly older child the attention span issue wouldn't be so great! Epic is out now on DVD and Blu Ray - on both of them there are special features such as an educational short video about the real equivalents of the characters - slugs, snails and birds. On the Blu Ray you can also find out about the concepts of camouflage along with the 'making of' Epic shorts.